and it is clearly visible, that hemoglobin is composed mostly of nitrogen. 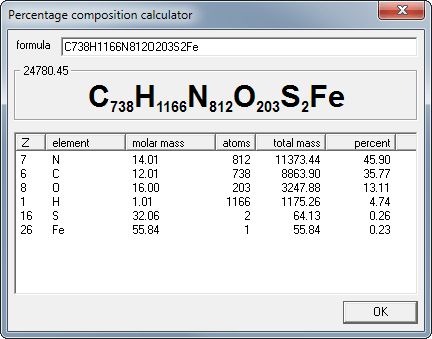 Generally speaking every correct chemical formula of neutral molecule will be properly analyzed, be it something simple, like H2O, or smomething more complicated, like (C2H10N2)3[Fe(CN)6]2. To be honest, we never though it may be really usefull, but after implementing many other parts of the program it was obvious that reusing parts of code from other calculators this one can be added in less than half an hour. We also know that hemoglobin example doesn't make much sense, as composition of such proteins depends on their source - it differs between species, or even individuals. So be it.